There are lots of different E-readers out there…just as there are lots of different rivers in Brazil. So far, these tutorials have been using pretty nonpartisan, platform-independent technologies: HTML and CSS, EPUB and RTF, JPG and GIF. My most recent instructional blog post covered using open-source Sigil to get us to an EPUB, the standard E-book format recognized the world over as the dominant electronic book platform for people who have never heard of an Amazon Kindle. I hate it when the Kindle tablet just kinda hangs there at the edge of the shelf until I jolt the vending machine. Right. Sure. EPUB is recognized the world over as the dominant electronic book platform for people who have never heard of an Amazon Kindle. But a lot of people have heard of an Amazon Kindle. 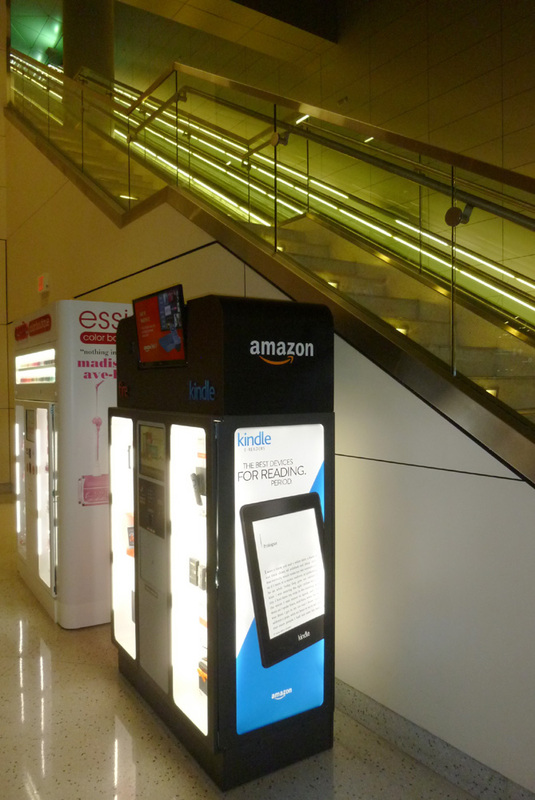 As I learned during Christmas travels, even the Minneapolis-Saint Paul Airport has heard of an Amazon Kindle. Someday, we will all drive solar-powered cars, vacation in Castro-free Cuba, and read E-books that are not on Amazon-controlled Kindles. I look forward to those days, but I need to live in (and publish for) the real world of 2015. “Kindle” is synonymous with “E-reader” the way “Google” is synonymous with “search engine”: many people aren’t even aware that the alternatives exist. Even Apple’s iBooks platform, arguably the most sophisticated and certainly the most widespread implimentation of EPUB, has but a small fraction of the North American readership. Everything Bicycle Comics has learned about formatting poetry anthologies for Kindle and Kobo. From MS Word to Kindle in six steps! There it is. 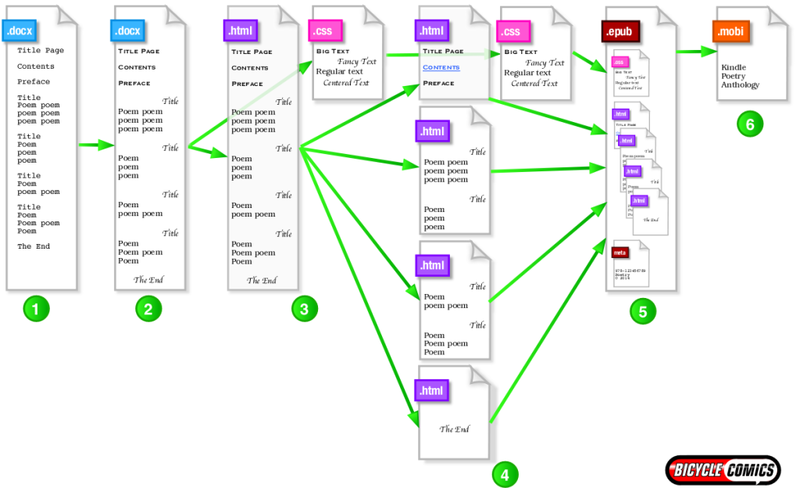 Depending on where you are in your publishing journey, that workflow looks beautifully simple or laughably Byzantine. Don’t worry; I’ll walk you through each of these steps in future blog posts. But big-picture, here is how we move an anthology from manuscript into Kindle and Kobo. Paste and proofread all the poems as plain text. We remove nearly all formatting from the poems. The document should look like (or actually be) a text file. Here we can check spelling and discuss proofreading/editorial changes with poets via E-mail. The entire interior of the book is in one whopping-huge Word document. Lightly format the book in Microsoft Word. We add basic structure to the book. If it can’t be done via the Style menu, then we probably won’t do it. We try to have all of our content debates now, because after this step, our book “forks” into two paths: one set of files goes to InDesign for our paperback edition, and one set of files goes to Dreamweaver for our E-book. If we make a change now, we make it one time. If we make a change later, we’ll need to make it twice. Save the document as HTML + CSS. We tell MS Word to export our document as HTML, and then we use Adobe Dreamweaver to tidy up the resulting code. We also pull all styling of the document into an external style sheet. If you’re coming from a traditional publishing background (QuarkXPress, InDesign, PageMaker), this step will seem the most foreign and tedious. I’ll talk you through it! Separate the HTML into chapters. We split our one huge interior HTML file into several smaller HTML files. For the most part, we split at chapters; each month of our Tandem anthologies is one chapter. Our table of contents, foreword, and contributor biographies become additional “chapters.” For the most part, we try to have all our chapters use the same, external cascading style sheet, but we’re open to adding one or two mini .css files if we really need them. Place the HTML and CSS files into an EPUB. We’ve been using Sigil, a free, open-source EPUB editor. Sigil wrangles together our HTML/CSS files, plus any images or media files we’ll be using. Sigil also helps us make a Table of Contents. Once we’re happy with our Sigil EPUB, we’re ready to publish on Kobo, Nook, and Google Play Books! Create a MOBI and/or KF8 book with Amazon Kindle Previewer. We use the free Kindle Previewer program to translate our EPUB into Amazon’s specialized Kindle format(s). On a tight budget? Bicycle Comics uses both commercial and free software to make our poetry E-books. In subsequent posts, I’ll offer advice on how to work through each step using low-cost substitutes for some of the expensive programs. The Yellow Buick Review · A fake literary journal exploring real formatting and publishing issues.